The Stroppies began life as an informal, weekly jam/recording project between three friends around a kitchen table with a desire to slap ideas together quickly and haphazardly on a four track cassette recorder. Fast forward two and a half years (a period which saw the band release a widely lauded self titled cassette EP that was repressed locally and internationally, a swag of 7"s and rack up a bunch of shows) and we arrive at "WHOOSH!" - the Stroppies first proper LP released through Tough Love records in the UK. Whoosh is a pop record. 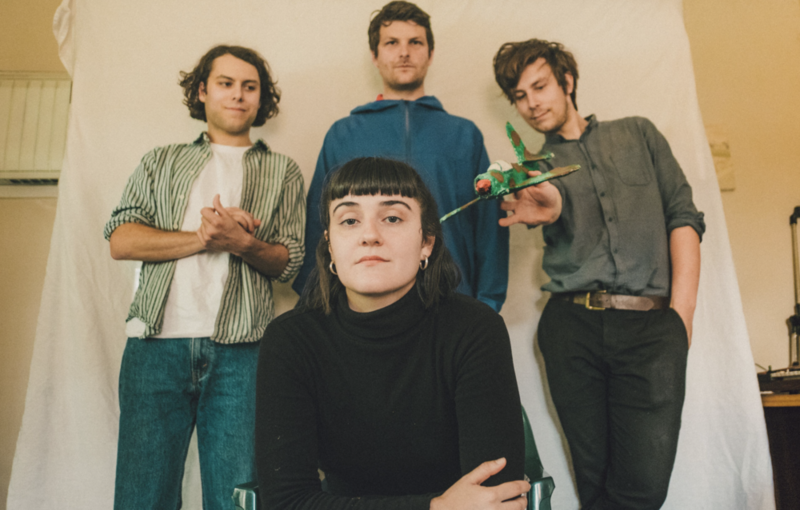 Referential yet idiosyncratic, the band cast a wide net drawing inspiration from the varied nature of their previous recorded output and incorporate influences ranging from 60s British invasion era rock, 80s D.I.Y. to classic era Warner Brother cartoons. All the elements that made the first Stroppies releases so endearing are present but the sonic and emotional palette however, has expanded on Whoosh! Where those earlier releases were made distinct by their sometimes scrappy, sometimes oblique sensibilities, Whoosh displays a sharpening of focus in terms of production and songwriting. The Stroppies has always been a collaborative effort and like all good collaborations, Whoosh! exceeds the sum of it's parts as the album blurs together to make a frenetic and singular impressionistic whole.